What a great way to customize and personalize your fav guitar! Give your guitar a name, or an endearing quality; make it your own. The engraving looks sharp, and the Truss Rod Cover fits like the original. These truss rod covers are actually better than the one's from PRS!! Perfect fit, look great and really fast service. And to top it all off they are very well packaged, will be buying more from these guys for sure!! These truss rod covers are a MUST HAVE for your PRS guitars. Great quality, fast service, and adds a touch of class to the guitar. I have one on each of my PRS's and will purchase more of these for any future guitars. Same day shipping is spot on!! What are you waiting for....just order one and you'll see what I'm talking about!! 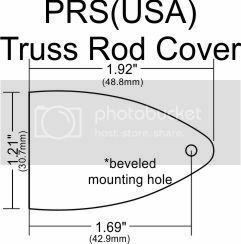 The truss rod cover has a very professional, classy look. The price is reasonable and their service is super fast. I'm on the west coast and every time I place an order I get it in two days.